Neill has put together a combination of his dream scents based on his floral couture experience and life-long passion for flowers and fragrances. His new range of seven extraordinary fragranced candles comprises: Belgravia, No.11, Santal d’Orient, Rose & Oud, Cassis Noir, Verdure and Christmas Eve. Poured in an ornate “cut-crystal” pressed glass vessel of 300 gms with an elegant metal lid that also serves as a stand, these candles have been composed with an unusually high percentage of exceptional quality fragrance oil produced with all natural, organic ingredients by one of the finest fragrance houses in the world in Grasse, France. 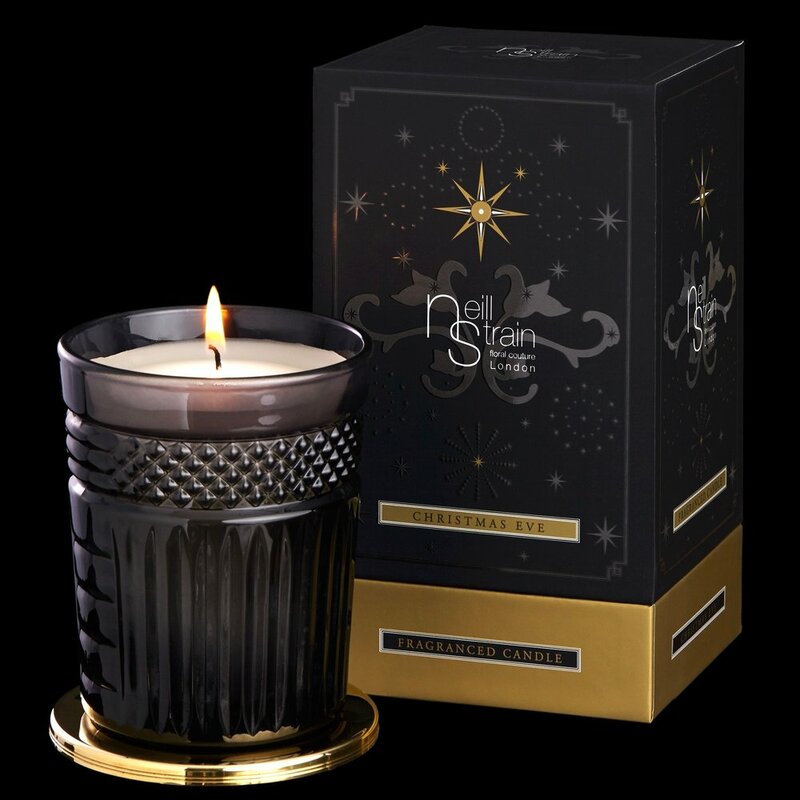 Luxuriously packaged in the signature Neill Strain Floral Couture style, these exquisite candles burn for 60 heavenly hours. Belgravia’s poised perfection conjures up visions of grand stucco fronted terraces and the elegance of its verdant squares. In private residents’ gardens, the setting for so many memorable summer garden parties, imposing Magnolia trees are underplanted with rambling garden Roses and seasonal florals. Capturing the essence of these memorable midsummer nights, Belgravia combines the complexity of Rose entwined with bewitching notes of Amber, Musk, Magnolia and Patchouli. Elegant stems of Lilies, hand-tied Lily of the Valley, petite couture arrangements of Violet and Cyclamen, vases of fresh foliage, secateurs on a marble bench … No. 11 piques the imagination and recreates the distinctive scent of Neill Strain Floral Couture’s iconic Belgravia boutique. The delicious blend of fresh florals is underscored with a hint of green leaves and base notes of Cedar and Musk. The vibrant character of No. 11 gradually blossoms into a lingering scent, reminiscent of one of our magnificent, bespoke bouquets. Embark on a mysterious odyssey to the East without leaving the comfort of your home … This evocative autumnal scent is infused with regal Sandalwood and blended with Ylang Ylang, Patchouli and Vetiver creating a decadent sense of abundance. Burn on its own or blend with florals. Utterly and unashamedly opulent, the sensual character of Rose & Oud recalls a secret garden. Framed with Jasmine arches and combining the lingering fragrances of mature Geraniums and opulent Roses … is it real or imagined? Oriental Oud adds to the illusion with exotic Amber, sultry Musk and romantic Patchouli creating a richly-scented ambience. On late summer rambles, Blackcurrants beckon ... their lush berry-laden branches trailing along the velvet moss of a forest floor. Combining the piquancy of summer fruits with the tartness of Blackcurrant Leaves and Moss, the richly-scented Cassis Noir is a modern classic. The aromatic woody Verdure evokes memories of the Mediterranean, long walks in the garrigue while vivid sunsets reflect across a horizon bordered by towering Cyprus trees. With base notes of Cedar and Sandalwood, Musk and aromatic Vetiver, the herbs and citrus of the Mediterranean leave a lingering sense of emotion recollected in tranquility. An instant mood enhancer, Verdure stands out on its own or can be burned simultaneously with other floral editions from our range for a completely unique experience. Thank you for joining the world of Neill Strain Floral Couture !